The hero of all heroes gets the full graphic novel treatment in ODYSSEUS: ESCAPING POSEIDON'S CURSE, adapted in terrific style by Dan Jolley and illustrated by Thomas Yeates. Monsters, gods, the flaws of human nature, and the loss and celebration of life are all on dazzling display in this beautifully crafted book by Lerner Publishing (under its Graphic Universe umbrella). The reader is first presented with a tantalizing cover of Odysseus fighting off the many-headed Scylla (who waits for ships at sea, with devastating results) and then the reader is introduced to the Greek legend of The Odyssey with a map that shows the journey that the King of Ithaca will take to get back home from the Trojan War to his beloved wife, Penelope. It's a voyage that will take him many years, in part due to his own character flaw of pride. (Hint: never reveal your true name to a Cyclops whom you have blinded with a burning spear). The epic, originally crafted by Homer, obviously had to be narrowed in focus, but Jolley does a commendable job of keeping the action of the story, and the actions of the characters, at the very center of this graphic novel. We see the follies of the gods as well as their desire to tinker with the lives of humans, for both good and ill. The book ends rather abruptly, with Odysseus all alone (his crew all dead) and finally heading home. The foreshadowing of the text and the look on the face of Odysseus lets the reader know that the men who have taken over his home in Ithaca and who seek to wed his wife and become king will be no match for the hero who has faced and survived so many showdowns with monsters and gods. The rest of the story will have to be left to our imagination (although readers of the Homer text know all to well what is to come). The illustrations and artwork in ODYSSEUS: ESCAPING POSEIDON'S CURSE is fantastic. With great detail and use of colors (contrasting light and darkness), Yeates does a wonderful job of pulling the reader into the story. The monsters spring from the page. The looks on the face of Odysseus and his men, in both terror and in triumph, are a perfect tandem to Jolley's version of The Odyssey. First, I wondered if they had ever been assigned to read a graphic novel by a teacher. No surprises here. 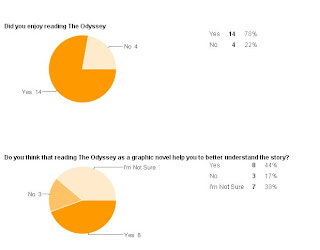 Next, I wondered if I gave them a choice between reading a story that was in traditional novel form or graphic novel form, which would they choose. I was surprised by this one, as I expected more to choose a graphic novel. Then, I asked about the book itself. I wanted to know if they enjoyed the story and if they thought reading it as a graphic novel helped them to understand the narrative. It is different because it has pictures and it is easy to understand. A graphic novel is different then a regular novel because a regular novel usually doesn't have that many pictures and graphic novels has mostly every page full of pictures. It is a lot smaller then a regular novel and it has pitchers. It has pictures and helps you better understand what is happening in my opinion. It also makes it more interesting. The thing I don't like about it is it is shorter. I think it's different because it has more pictures and there's less writing and less details. It's like a comic book except that all the pictures are jumbled on the page instead of in a row...It can get kind of confusing. I would've like to just learn a little bit more about how to read a graphic novel. 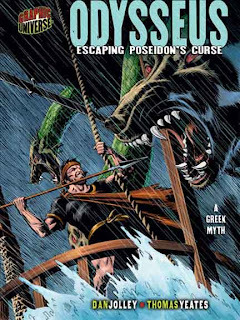 I did figure out how to read the book though, so it's OK.
ODYSSEUS: ESCAPING POSEIDON'S CURSE gets high marks across the board: the writing is engaging and crisp, the artwork is detailed, and the story, of course, is a classic. This book is highly recommended for middle and high school readers, and perhaps for some advanced readers in the upper elementary grades, too. It should be noted that there is death and violence in here, but not the gratuitous kind. Men die at the hands of monsters and nature, and every decision by Odysseus has a price. It reminds us that we have a responsibility when it comes to our actions.